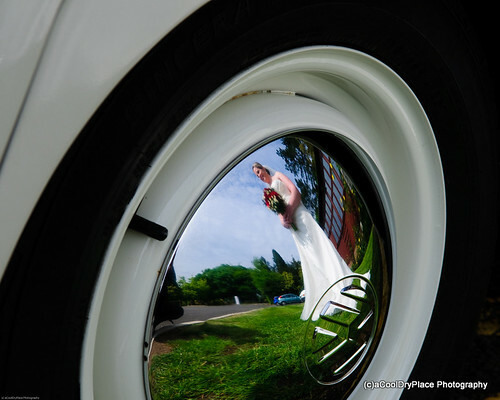 Chris and Laura got married at the end of May at Lane End Conference centre, near Stokenchurch. 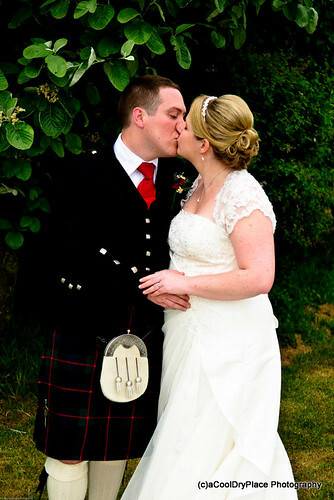 I’d met them about 6 months previously at the venue to discuss their requirements and see the site. 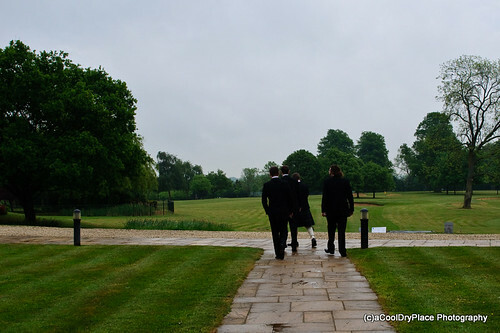 Their intention was to get married outside (well in a gazebo, since the law in the UK requires weddings to take place in a structure) with the indoor venue being available as a backup plan in the event of poor weather. 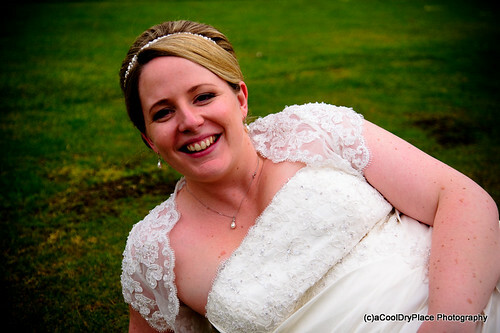 Meeting the photographer before a wedding is important to ensure that you like your photographer, and for the photographer to be sure he likes you. Chris and Laura are friends of my sister-in-law, and as she observed in a mildly drunk state at the wedding, “nobody can not like Laura, she’s lovely”. 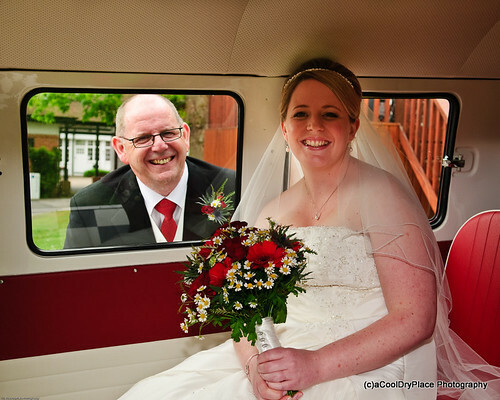 Chris and Laura are both exceptionally friendly and easy going, so it was a pleasure to do their photography. 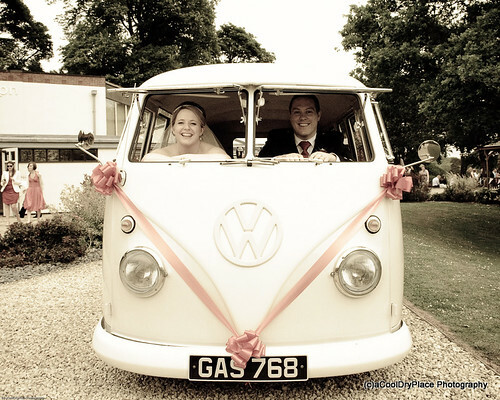 They had hired an awesome vehicle for Laura’s wedding transport to the wedding – one of the oldest, if not the oldest, VW camper van in the UK. It made my MGB that I was travelling look quite modern. The chauffer and I shared one concern – the heavy rain. For me, it meant limited visibility while driving as my windscreen wipers are rubbish. 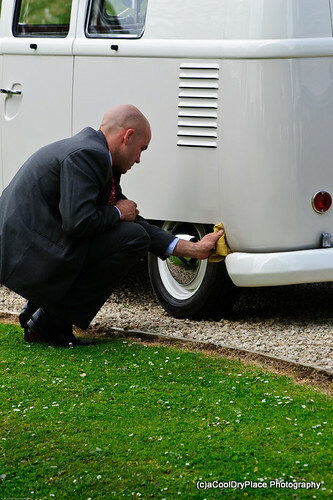 For him, it meant polishing the white exterior every time he stopped. Did I mention the outdoor wedding plan? With about an hour to go to the wedding, the sun started breaking through and Chris and Laura (by phone) made the brave decision to go ahead with the outdoor plan, knowing that once the wedding started their was no relocating for them (although their guests would have been free to run away to shelter.) The decision paid off, and it was glorious weather. Perhaps a bit too nice really. Every photographer would prefer an overcast day – it makes for better portraits as their are less strong shadows. 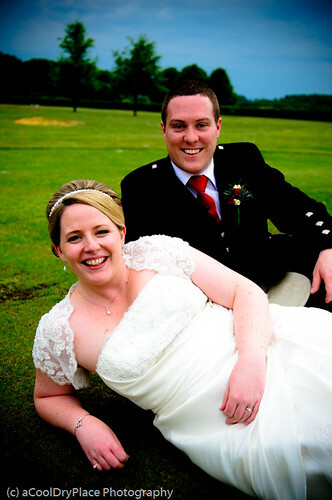 Talking of portaits, Chris and Laura had a very relaxed time table to their wedding day. This meant that there was space, on their request, for us to wander a bit away from the guests to do some more interesting portraits of them as a couple. I’m not one to impose in this way, so make it clear to the couple that if that is what they want then they need to request it. Consequently, it doesn’t normally find its way into the day. As a photographer, it was fantastic to have this opportunity to spend some time getting the couple some lovely portraits, and I hope for them it was a chance to have a break from the hubub of the day. 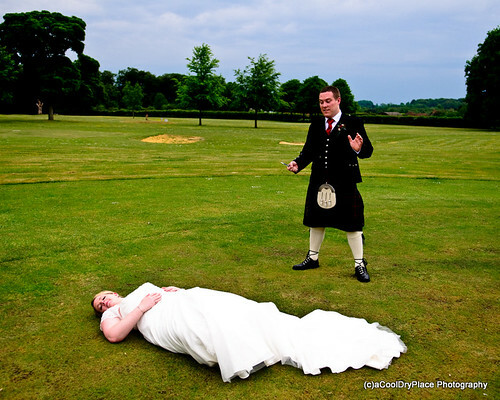 I have seen at wedding the photographer drag the couple away for such shots. 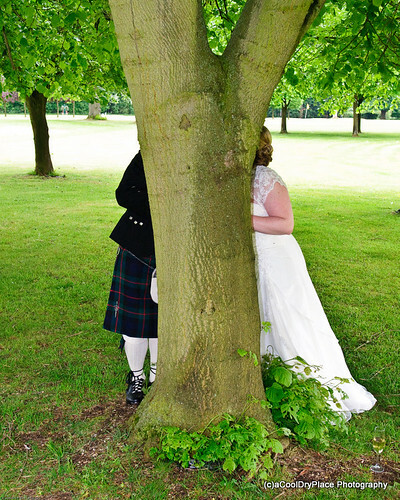 As this was after the ceremony, Laura was also more relaxed about her dress, which opened up the opportunity for some fun shots. Chris and Laura’s wedding was my first wedding working with a second photographer. 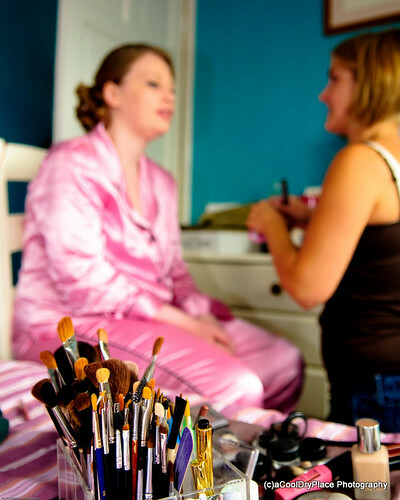 I always offer a second photographer services, as it has a number of benefits; Their is someone to cover the groom getting ready while I photograph the bride’s preparations, I don’t need to rush to the venue much ahead of the bride to get shot of the groom waiting, someone can focus on mother’s reactions during the wedding without the main action being missed etc. I’ve not had anyone decide that these benefits are worth the extra I would have to charge for the service, but it’s there as a possibility. 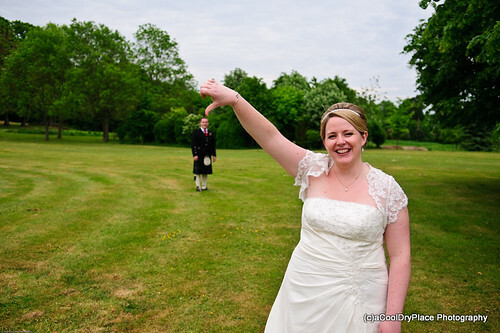 On this occasion, Chris and Laura had a friend, Marisa, who was a keen photographer and had asked to be involved. After a few initial emails to estabilish the ground rules to the working relationship, I was happy that we could work together. If I was being paid for the second photographer, I would use an assistant who I had worked with previously, but on this occasion Marisa was unpaid and doing the photography as their friend. This meant I wasn’t in a position to fully trust her with the important shots, but at the same time it was nice to have someone to work with to improve the level of photographic coverage. 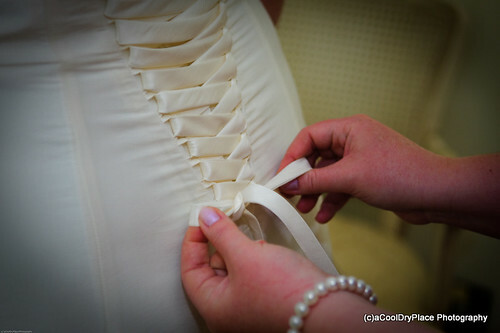 What I learnt from the experience is that it is very useful having a second photographer. Marisa got some great shots that I would have been able to do while I focused on my main photographic duties. Its very hard to credit her individually for her shots, but many have been included in the final selection. Most importantly, I’ve learnt that synchronising camera clocks prior to the event would make editing after the event a lot less painful!